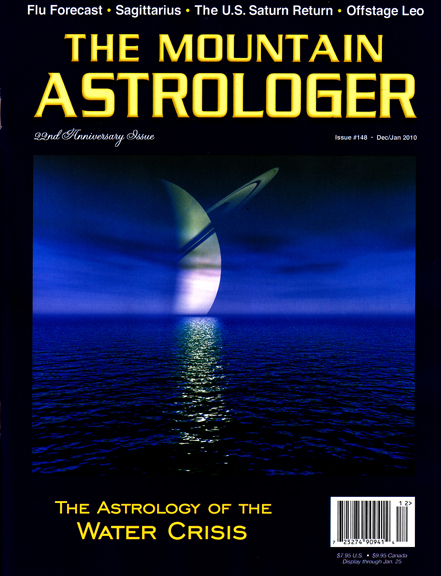 The current issue (Dec/Jan 2010) of The Mountain Astrologer, one of the leading periodicals of the global astrology community, has a great review of Dancing on the Brink of the World. Mary Plumb gave us a good chunk of a page, so it’s worth going out and getting the whole issue at your local news stand. It’s their 22nd anniversary issue and the title story is “The Astrology of the Water Crisis,” an intriguing take on how the archetypal element of water relates to the substance itself. The work is a creative project that offers the wisdom of the signs of the zodiac to a different audience — people with no astrological background — as well as giving astrologers as new understanding of the signs. There’s a lot of interweaving and integration of themes throughout the work — and it’s fun. Thank you Mary Plumb and TMA!